Do you have flat feet? Flatfoot can affect people of all ages and is noticeable by a lack of the small arch in your feet. 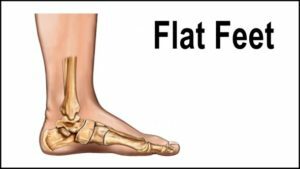 Flatfoot is usually not a serious medical condition, but can lead to pain and discomfort in the feet. Also it can cause fatigue while performing physical activity. Flatfoot, if severe and not treated, can be a symptomatic condition in which the feet can become limited or disabled. Treatment for severe flatfoot includes physical therapy, the training and strengthening of the feet, using customized orthotics or inserts, and surgery. Having flat feet can create a myriad of foot and ankle problems. For assistance, consult with one of our podiatrists from Foot HealthCare Associates. Our doctors will provide quality care for your feet.